After being invaded by Germany in the west and later by Soviet Russia in the east, the Polish government fled Warsaw but continued to fight from abroad. After Germany attacked Russia, the Russians decided to release their Polish prisoners of war, who then began re-forming into an army. In April 1942, several of these Polish units landed in Persia and began a trek through a mountainous area heading toward Egypt and Palestine to re-group under the direction of the British Army. While in the mountains, the story goes that a group of soldiers happened on an Iranian shepherd boy who had found an orphaned Syrian brown bear cub. (Supposedly the mother had been shot and killed.) Food was scarce, so the boy agreed to trade the cub to the soldiers for some canned meat. The Polish soldiers had come from nothing, had lost everything during the war. The bear became so much more than just a mascot to them. He was a real boost to their moral. 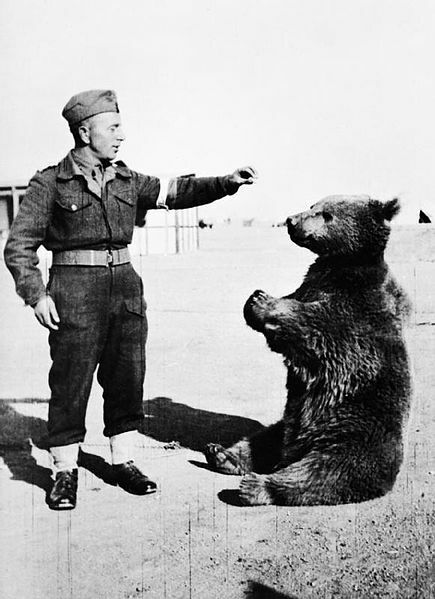 At this point, Wojtek became an unofficial member of the 22nd Transport Company, Artillery Division, Polish II Corp. When the company relocated to Iraq, then Syria, Palestine and Egypt, Wojtek moved with it. While Wojtek was young, the soldiers nursed him with condensed milk placed in empty vodka bottles, then fed him fruit, honey and syrup until he was able to eat more solid foods. Knowing little about the care and feeding of bears, they eventually treated him as if he were just another solider, including giving him beer rations, which quickly became his favorite beverage. He also developed other vices over the years like smoking and eating cigarettes. Despite his smoking habit and seemingly a lack of proper nutrition for a bear, Wojtek grew to be a nice sized brown bear standing in at about 6 feet tall and weighing around 485 pounds. His favorite pastime was wrestling his comrades, though he also enjoyed a good game of tug of war. Besides these activities, Wojtek enjoyed playing with other animals. He was best friends with a Dalmatian belonging to a British liaison officer. The two animals would play and wrestle together. Not all animals were open to befriending the bear though. Wojtek at one point approached a horse in a field and was kicked in the head and neck several times. He reportedly stayed away from horses and mules after that. In Palestine, Wojtek inadvertently helped capture a thief who broke into an ammunition compound. To the thief’s surprise, besides ammunition, he found Wojtek, who often slept in there. Upon seeing the bear, the would-be thief made quite a commotion, which alerted the soldiers who then arrested the man. Wojtek was rewarded with a bottle of beer. As the Polish Army came closer to entering the war zone in Italy in 1943, the soldiers pondered the problem of Wojtek’s status, in that if he was to continue to accompany them, they’d be bringing him to the front line. This problem came to a head in 1944 in Egypt when the soldiers were headed to Naples. The port authorities refused to let the bear board the ship. They solved the problem by giving Wojtek his own paybook, rank and serial number. They even taught him how to salute like a proper soldier. After the paperwork was filed, he was officially a member of the Polish Army in the 22nd Artillery Supply Company of the Polish II Corps, and he was now allowed on the ship. In Naples, it was British Courier Archibald Brown’s job to help process Polish soldiers that had just arrived from Egypt to advance with British soldiers against German and Italian forces. But when he called Wojtek’s name, no one answered. “We looked at the roster, and there was only one person, Corporal Wojtek, who had not appeared,” Brown said in an interview years later. So he asked the other soldiers why Wojtek didn’t come forward. 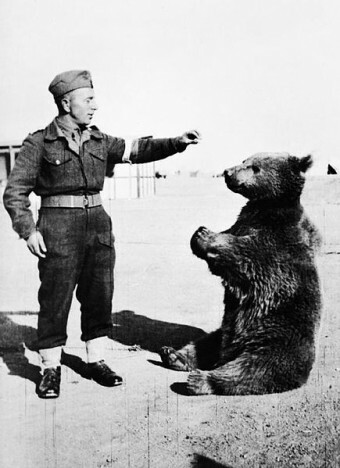 An amused soldier replied: “Well, he only understands Polish and Persian.” To his great surprise, Brown was led to a cage holding a full-grown bear. Wojtek soon proved he was more than just a mascot when, during the series of assaults known as the Battle of Monte Cassino, he put his strength to good use after being trained to carry heavy crates filled with mortar shells from the supply trucks, delivering them to the men operating the large guns on the front line. 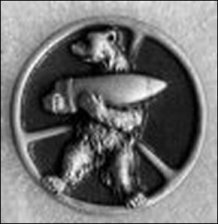 After the battle, a likeness of Wojtek holding a shell became the official badge of the 22nd Transport Company. The image was put on vehicles, flags and uniforms. At the end of the war, about 3,000 Polish soldiers and their bear ended up being stationed in Berwickshire, Scotland for nearly two years. As the soldiers were demobilized in 1947 and sent home, they said some heart wrenching goodbyes to Wojtek. …his old friends would come and visit and occasionally they would jump the fence and give him a cuddle or a bottle of beer. If he heard the Polish language spoken, he would often perk up. In the wild, Syrian brown bears typically live to about 20-30 years old. However, in captivity they can potentially live as long as 48 years, but it was not to be for Wojtek. He died in December of 1963 at the age of just 22. Are Koalas a Type of Bear? Over the years, Wojtek became a symbol of solidarity between Poland and Scotland. In 2009, Scottish Parliament held a reception in Wojtek’s honor and in 2011, a parade through Edinburgh included a eulogy, in Polish, to the bear-soldier. Donations from people all over the world paid for a large bronze statue of Wojtek in Edinburgh which was officially approved by the Kraków council on April 25, 2013. 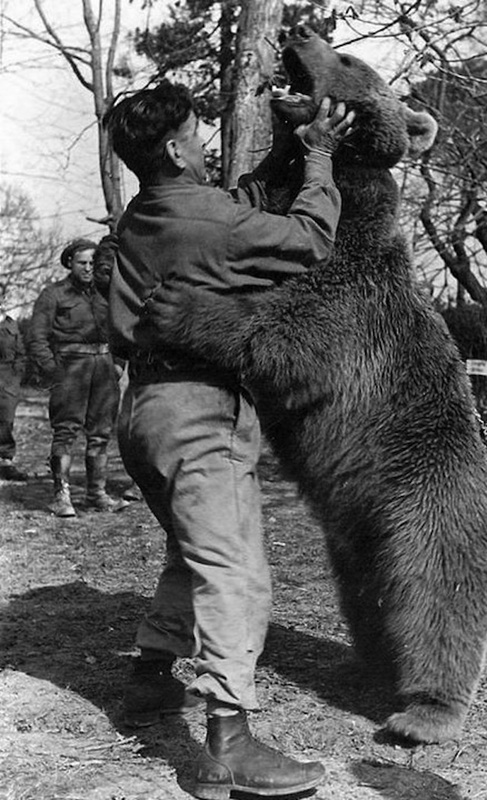 As you might expect, once he was full grown, fewer and fewer of the soldiers would challenge Wojtek to wrestling matches as he was, well, a bear. However, he learned that if he was too rough with them, they wouldn’t wrestle anymore and so was generally very gentle and even would let an occasional soldier win a match. Wojtek is a common name in Polish, actually an abbreviation of Wojciech. “Wojciech” etymologically indeed means “the warrior who enjoys to fight” (or similar meanings, like you mentioned) but I guess that nobody in Poland would ever think of that. It’s like saying that Joe means “God will increase” and that people would choose this name for that reason. Wojtek was chosen for the bar simply because it is a common name. Sure thing but I don’t think bears are that common in the Polish army 🙂 You got to give the dude respect man! I cannot bear to think of Wojtek being treated like any other bear. A VERY GOOD ARTICLE, STACI. I STARTED READING IT RELUCTANTLY, THINKING IT 2 B SOME SORT OF FEEL GOOD GIMMICKRY OF POLES….BUT MAN, I WAS HOOKED BY THE TIME I REACHED THE BEAR ENCRYPTED ON OFFICIAL SHIELDS. LEFT ME WITH A WARM FEELING FOR THOSE POLES. The teaser said not to worry, the bear lives. The bear died at 22. Very sad. You lied. What is really sad is that most of the Polish soldiers who fought so bravely for the Allied (they were the fourth largest fighting force) could not return back home to Poland. Why? Poland was given over to Stalin who set up a puppet communist government which ruled Poland until 1989. But, Poland is free and strong again and becoming stronger every day. Wojtek would be happy for this friends. I have heard this story before, but never told as well as this. Truth stranger than fiction. It should be made into a movie! Enjoy – the story of Wojtek is the story of World War II and Poland in all this. Priceless lesson. Actually Wojtek did well in captivity and was a beloved figure in the zoo, he just had a habit of eating lit cigarettes, his death was caused by complications of the throat. I have a great number of Polish friends and several of them have told me about Wojtek. It only confirms what I’ve come to believe all along–that Poles are so baddass that they have real live bears serving in their army. Put in a zoo after being a soldier. That is seriously one of the saddest, most horrible stories I have ever heard. How utterly heartbreaking; and cruel. Of course he died young. Imagine how he felt inside the day he was left behind by his comrades to live in a cage. be so judgmental? My one regret is that Wojtek didn’t get to spend his time with the rest of his buddies. We demand the right to arm bears.